“Humor on the Way to Heaven” from Christian Faith Publishing author Janet Gillespie-Orsborn is a book of end-of-life observations while caring for terminally ill family members, written with candor and compassion. 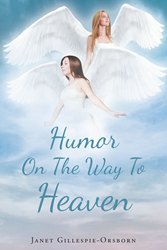 “Humor on the Way to Heaven”: a collection of true stories putting an empathetic and human face on the dying process. “Humor on the Way to Heaven” is the creation of published author Janet Gillespie-Orsborn, a mother and grandmother who spent thirty years as a medical office manager. Published by Christian Faith Publishing, Janet Gillespie-Orsborn’s new book is a compassionate reminder that the love and humanity that touches people in life does not disappear in death. View a synopsis of “Humor on the Way to Heaven” on YouTube. Readers can purchase “Humor on the Way to Heaven” at traditional brick and mortar bookstores, or online at Amazon.com, Apple iTunes store, Kobo or Barnes and Noble. For additional information or inquiries about “Humor on the Way to Heaven,” contact the Christian Faith Publishing media department at 866-554-0919.